Over the past few months, we at Cetis have been involved in a number of analytics related activities, most notably our Analytics Series of papers and case studies. Although we know there are pockets of really exciting developments here in the UK, we are keen to find out more about what is actually happening in our Universities and Colleges. In order to give us (and the community) a more accurate insight we are launching our Analytics in UK Further and Higher Education survey. From teaching and learning to the library to registry and business intelligence, we need to hear from you! The survey is quite short (12 questions) and has been designed to try and allow us to undertake a “lite” benchmark of activity in the UK sector. We’d really appreciate if you could take 10 minutes or so to give us your feedback. The survey will stay open until June 16. Once we have all the data we will of course publish the results. We will be sharing our initial analysis of the data at a session at this years ALT-C. The survey can be accessed here, please feel free to pass the link on to any relevant colleagues. Later this week I’ll be chairing a (free) webinar on Learning Analytics for Assessment and Feeback. Featuring work from three projects in the current Jisc Assessment and Feedback Programme. I’m really looking forward to hearing first hand about the different approaches being developed across the programme. The webinar takes place Wednesday 15 May at 1pm (UK time) and is free to attend. A recording will also be available after the session. You can register by following this link. I was delighted to take part in the University of Southampton’s 2nd digital literacies conference (#sotonmooc) event yesterday. I gave a presentation on my experiences of being a student on MOOCs. However, what really made the day for me was hearing from some “real” students about the range work they have been involved in as part of the University’s DigiChampions project. The project has been incredibly successful in getting students involved in the concept of digital literacy and getting them to provide support to their peers in a whole range of ways as this video rather neatly explains. The development of digital literacies is increasingly been recognised as vital for the success of our student population both whilst they are studying and also when they move into the workplace. It was fantastic to hear students share so eloquently their understanding of the importance of being able to use social networks effectively – not only for studying but also to improve their chances of getting a job. As we watched student created videos and a range of other presentations, it was clear just how much the students appreciated the innovative approaches of modules such as “living and working on the web”. Having time to develop skills and networks as part and parcel of undergraduate activities has certainly seemed to pay pretty significant dividends in terms of students developing contacts with potential employers and in several cases in terms of them securing a full time job. Watch the video to see for yourself. But what about the Rhino I hear you ask? Well another one of the student driven projects is Erica the Rhino. Erica is a cyber rhino, who is being developed in a truly interdisciplinary way. I thought this was just a fantastic project. I’m now following Erica on twitter and looking forward to hearing updates from when she is released into the wilds of Southampton. We need more projects like this. Many thanks to Fiona Harvey and Hugh Davies (and everyone at Southampton involved in organising and running the event) for inviting me. It really was inspiring to hear from the students. More information about the day is available from the event website. It will be being updated with presentations (and I think recordings) over the next few days. You can also catch up on the tweets and pictures from the event here. 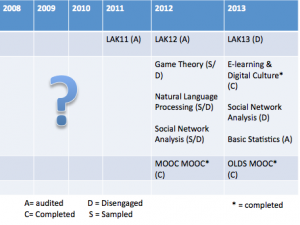 Following from my early post, I’ve attempted to use the classifiers outlined in the #lak13 paper on disengagement in MOOCs, in the context of my experiences. Obviously I’ve modified things a bit as what I’m doing is more of a self reflection of my personal context -so I’ve made the labels past tense. I’m also doing a presentation next week at the University of Southampton on the learner perspective of MOOCs and thought that these classifications would be a good way to talk about my experiences. A big caveat, not completing, disengaging and dropping out does not mean I didn’t learn from each he experience and context of each course. More to come next week including the full presentation. 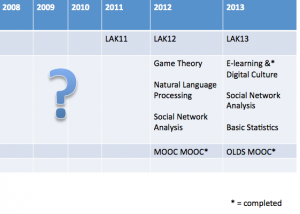 No educational technology conference at the moment is complete without a bit of MOOC-ery and #lak13 was no exception. However the “Deconstructing disengagement: analyzing learner sub-populations in massive open online courses” paper was a move on from the familiar territory of broad, brush stroke big numbers towards a more nuanced view of some of the emerging patterns of learners across three Stanford based Coursera courses. As I listened to the authors present the paper I couldn’t help but reflect on my own recent MOOC experience. Their classifier labels (auditing, completing, sampling, disengaging) made a lot of sense to me. 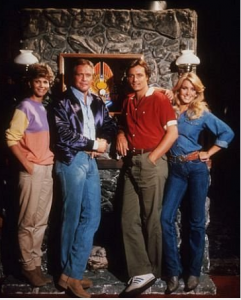 At times I have been in all four “states” of auditing, completing, disengaging and sampling. The study investigated typical Coursera courses which mainly take the talking head video, quiz, discussion forum, final assignment format and suggested that use of the framework to identify sub-populations of learners would allow more customisation of courses and (hopefully) more engagement and I guess ultimately completion. I did find it interesting that they identified that completing learners were most active on forums, something that contradicts my (limited) experience. I’ve signed up for a number of the science-y type Coursera courses and have sampled and disengaged. Compare that to the recent #edcmooc which again was run through Coursera but didn’t use the talking head-quiz-forum design. Although I didn’t really engage with the discussion forums (I tried but they just “don’t do it for me”) I did feel very engaged with the content, the activities, my peers and I completed the course. I’ve spoken to a number of fellow MOOC-ers recently and they’re not that keen on the discussion forums either. Of course, it’s highly likely that people I speak to are like me and probably interact more on their blogs and twitter than in discussion forums. Maybe its an arts/science thing ? Shorter discussions? I don’t really know, but at scale I find any discussion forum challenging, time consuming and to be completely honest a bit of a waste of time. The other finding to emerge from the study was that completing and auditing (those that just watch the videos and don’t necessarily contribute to forums or submit assignments) sub-populations have the best experiences of the courses. Again drawing on my own experiences, I can see why this could be the case. Despite dropping out of courses, the videos I’ve watched have all been “good” in the sense that they were of a high technical quality, and the content was very clear. So I’ve watched and thought “oh, I didn’t know that/ oh, so that’s what that means? oh that’s what I need to do”. The latter being the point that I usual disengage as there is something far more pressing I need to do But I have to say that the experience of actually completing (I’m now at 3 for that) MOOCs was far richer. Partly that was down to the interaction with my peers on each occasion, and the cMOOC ethos of each course design. 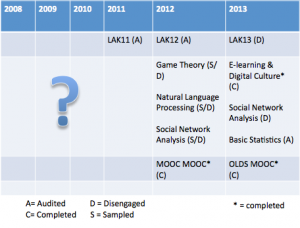 That said, I do think the auditing, completing, disengaging, sampling labels are a very useful addition to the discourse and understanding of what is actually going on within the differing populations of learners in MOOCs. A more detailed article on the research is available here.